Bob: And so we arrive in 1977, the year I started school! Andrew: And ten years before I was born! Bob: Oh, shush. 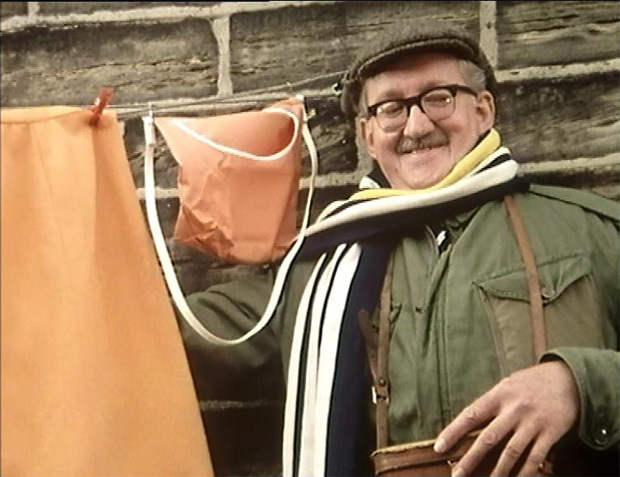 I thought it was worth pointing out that, although the series later became synonymous with early Sunday evening entertainment, for the first ten years of Summer Wine it was very much a late-night midweek show! These earlier episodes tended to be broadcast on a Monday or Wednesday evening, and I’ve a feeling that the first few series even went out in a surprisingly adult 9.30pm slot. Which possibly explains the grittier, more robust feel of these early years – it was very much intended for a different kind of audience to the latter series. Having said that, this episode is rather gentle and whimsical… the crux of the plot being Compo’s lost ferret, and the possibility that said rodent has taken up uninvited residence in the Batty household. The plot, in the main, plays second fiddle to some top-notch Roy Clarke musings, though. ‘Funny things, feet,’ ponders Clegg, at one stage. ‘If they were turned the other way round, we’d be able to stand much closer to walls’. These are men with LOTS of time on their hands. Andrew: I can’t quite put my finger on it, but from the offset there is something very different about the opening of this new series. There aren’t any major changes; just a lot of little things that add up to alter the tone. The first thing that struck me is that everything, both outdoor and indoor, is brighter – especially the Café – pulling us away from the grim atmosphere of the earlier shows and pushing us towards something a little lighter in tone. A little more picturesque, maybe. I should restate that this isn’t a pronounced difference, just a subtle shift, but it took a while for my eyes to get used to everything. Even Compo’s hat is a lighter shade of Green! Ronnie Hazlehurst also seems to have been encouraged to provide more incidental music than before. Compared to the early series, this episode is drenched in his lilting melodies… in a good way! I particularly loved his adaptation of Singin’ in the Rain, during the scene in which our trio enjoy ice-creams while hiding under their umbrellas. There’s also the look of our leads. Is it just me, or does everybody suddenly look a bit older? Foggy’s hair is longer and wispier, Clegg is greyer and even Compo’s stubble has turned white. 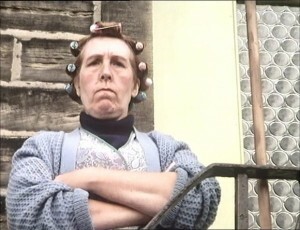 This ageing, however, might be attributed to make-up artist Janis Gould, who wasn’t credited last series. Then again, they might genuinely be growing into the parts… it’s been a year since the last series, and John Comer in particular looks a bit worse for wear. Bob: For all Clegg has become more whimsical over the course of three series, he’s still capable of some splendid rants about the ravages of modernity, and what he sees as the passing of ‘his’ beloved England. ‘There are generations growing up who think that meat really tastes like that!’ he grouches, in a rather unprovoked tirade about the ubiquity of the frozen beefburger. Later, he has a grumble about the reasonably recent implications of decimalization… ‘With the will of politicians to get rid of everything British, even the humble guinea pig will have to become 105p…’ he ponders, brilliantly. This stuff is never out of character, and I absolutely buy into Clegg as a man mourning the loss of the comfortable, significantly smaller world that he enjoyed during his younger days, but I’m also beginning to wonder if Clegg is sometimes a mouthpiece for Roy Clarke… a lot of these grumbles seem very heartfelt and passionate, and it’s hard not to imagine Clarke taking great joy in pouring his own personal middle-aged grumbles and grouches into Clegg’s extended dialogue. Foggy and Compo are great characters, but clearly not an extension of Clarke’s personality at all. With Clegg, I’m not so sure. There’s a glorious moment in this episode when Foggy, creeping around on the Batty doorstep in search of the missing ferret, is unaware of a furious-looking Nora opening the door behind him. And – in hilarious unison – the studio audience gasp in horror. It’s a fabulous reaction, and what a testament to the impact these characters have had on the public consciousness in just a few short years. 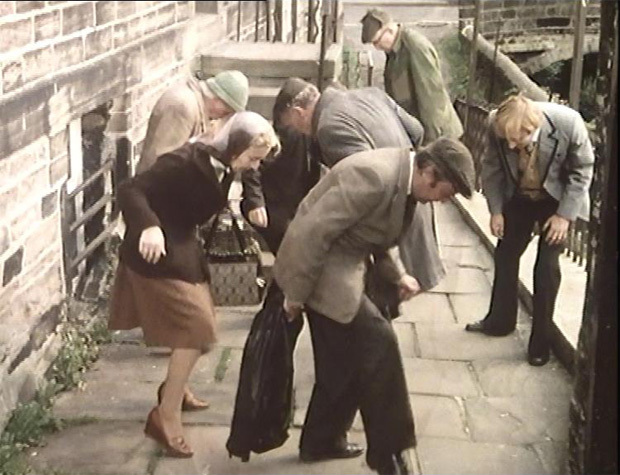 In an era of three TV channels that – in the pre-home video era – absolutely HAD to be watched live, shows like Summer Wine became a huge part of our collective cultural experience, and there’s your proof, right there. The audience KNOW these characters intimately, and absolutely buy into the fiction of Summer Wine. They know how Nora’s going to react before Roy Clarke has even put pen to paper, because Nora – as with all of these characters – has become real to them. That gasp is the sound of TV viewers completely inhabiting this little fictional world, and it’s beautiful. Brought a little rosy glow to my heart, that did. Andrew: You’re spot on. Every essential element of the series is firmly in place now, and it’s great to actually hear the audience anticipate certain actions. It’s also a little strange to me, though, how much the studio audience itself becomes part of the show. We’ll never know their names, and in all probability many of them are now dead, but in every sitcom of this era the studio audience is a character in and of itself. The Dance of the Lost Contact Lens! Bob: There’s a nice little scene in Compo’s house towards the end of this episode, and a timely 1970s reference as Compo spills milk over himself… ‘Are you getting enough?’ grins Foggy, the tagline to a late 70s advertisement from the Milk Marketing Board. We get a good look at Compo’s décor in this scene, and a lot of effort and attention to detail has been poured into it by some inventive set-dresser or other. 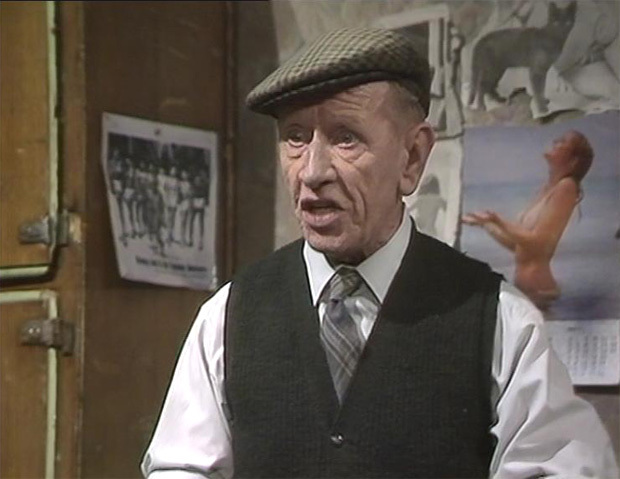 The nick-nacks on his walls are charmingly reflective of his character… we see naked Pirelli Calendar girls and beach bombshells snipped out of newspapers (probably during the baking summer of 1976, the quintessential ‘Phew, What A Scorcher!’ year). There’s an ancient photo of a shaggy black dog, clearly once loved by Compo but now presumably long-deceased, and – on the opposite wall – the spoils of decades worth of mild kleptomania… a sign offering the stern instruction to ‘NOW WASH YOUR HANDS’ has clearly been pilfered from some pub or boarding house during a long-lost drunken escapade, and there are others that I couldn’t quite decipher. It’s absolutely the home of the light-fingered, single layabout that we’ve come to know and love. Andrew: Very much like the ‘museum’ we ended up visiting at the location of Compo’s house when we went to Holmfirth some thirty years later. In effect, a room full of tat, but very easy to get sentimental about. 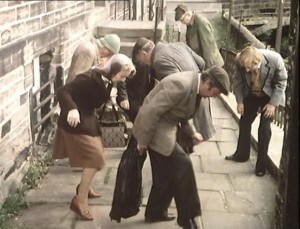 Bob: And so we finish with a bizarre and oddly beautiful ballet of passers-by tiptoeing around Nora Batty’s doorstep, fruitlessly searching for a non-existent contact lens as Compo’s lost ferret gazes down from the window above. It’s marvellously choreographed and effortlessly strange, and the perfect coda to a charming, warm-hearted episode. The pilot was shown at 8pm on a Thursday. Seasons 1-4 started at 9:25 on Monday or Wednesdays. Xmas 1978 was the amazingly late 10:40. Season 5 and the 1979 special turned up at 8:30. Back to 9:25 for Season 6. Thereafter, Xmas episodes aside, it was always on a Sunday apart for season 13 (1991), which was Friday at 8pm for some strange reason..
Compo dunking a sausage in his tea is quite a sight. But it matches his precious stolen photo of Nora, I suppose. Sid’s paper napkin stuff seems oddly callous, as though compensating for the lack of Ivy. Compo’s communication with Wally is the sort of thing Foggy should be approving of, very war-time. The mystical dance of the contact lens sums up what is another shaggy dog story… or possibly a shaggy ferret.